Economy class return air fares from the UK (flight inclusive option). A single, timed group transfer to/from Geneva airport. The option of joining one of our pre-trip meets in the Cotswolds. Suitable for those with strenuous trekking experience in high mountain environments. An exciting trip carefully designed to maximise the chances of a successful summit bid. The pre-Mont Blanc climbs were more demanding and more useful than on a previous (unsuccessful) trip with another company. Liked the provision of technical kit eg crampons. The trip was excellent, everyone was nice and we swapped stories of our life adventures. For the next week we climbed three mountains - it was BRILLIANT. I am so glad I did this and will be doing it again. Thanks to Kevin O'Neale and Mountain Kingdoms. The highest mountain in Western Europe is an irresistible challenge for experienced trekkers, and this nine-day holiday from Mountain Kingdoms is specially designed to maximise the chances of reaching the summit of Mont Blanc. Our alpine base is the tranquil, beautiful valley of Saas Grund, where we stay in a mixture of hotels and mountain huts. We begin this Mont Blanc trekking holiday with climbs to the summits of two spectacular mountains of over 4000m/13,000ft – the Weissmies and the Alphubel, or Strahlhorn. These are excellent, non-technical mountaineering objectives but also greatly assist with our acclimatisation to altitude – essential for the climb to Mont Blanc. An alpine skills day ensures familiarity and ease with glacier travel, crevasse rescue, and use of ice-axe and crampons before we begin trekking up Mont Blanc. We spend one night at the Tête Rousse hut and one night at Gouter hut which, as a safeguard against poor weather, will provide us with two opportunities to undertake the final trek to Mont Blanc’s summit, for an unforgettable alpine sunrise. Call Mountain Kingdoms on 01453 844400 for the chance to conquer the highest peak in Western Europe. Arrive Geneva. Group transfer to Saas Grund. Introductory briefing. Ecole du Glace refresher skills training at Hohsaas on the Trift Glacier. Ascent of Weissmies, 4,017m/13,179ft, to aid acclimatisation. Depending on weather conditions transfer to either the Langflue hut or the Britannia hut. Ascend the Alphubel, 4,206m/13,799ft, from Tasch hut, or the Allalinhorn, 4,027m/13,123ft, from the Britannia hut. Drive to Chamonix. Lift to Bellevue and tram to Nid d’Aigle. Walk to the Tête Rousse Hut. Climb to Mont Blanc Summit, 4,810m/15,781ft. Descend to Gouter Hut. Reserve day for Mont Blanc or drive back to Saas Grund. Transfer to airport. Fly back to London. 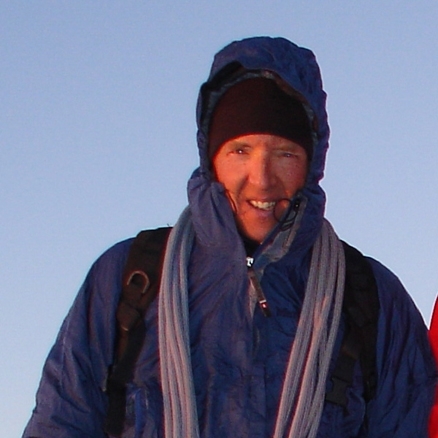 Kevin O'Neale qualified as a British Mountain Guide in 1992. It is the highest internationally recognised qualification for instruction and guiding in rock and ice climbing, mountaineering and off-piste skiing and ski touring - the coveted IFMGA carnet. It is recognised throughout the mountain world as your guarantee of their professional training and competence in all aspects of mountaineering and client care. Kevin also possesses the Mountaineering Instructors Certificate – M.I.C – the highest UK qualification in Mountaineering. He has been an instructor and mountain guide in the UK since 1978, having worked in North Wales, the Lake District, the Swiss and French Alps, as well as the Highlands of Scotland, and the Indian and Nepal Himalaya since then. He has based himself in Saas Grund and the Swiss Alps from 1994 to the present. On arrival at Geneva airport there will be a single group transfer to your hotel. This is timed to fit the group flight, please check with us for further information. At around 7.30 in the evening there will be an introductory meeting and kit check, at which you will be issued any technical gear you need - crampons, ice-axe, helmet or harness. We will make sure that your Alpine Mountaineering Insurance is in order and discuss the itinerary for the next few days in the light of the most recent weather forecast. Day 2 - ‘Ecole du glace’ refresher skills training at Hohsaas. At approximately 09.30 you will be met by the guides and after a final check of gear make your way to the main Saas Grund lift station at 1,550 metres, for the lift up to Hohsaas at 3,130 m/10,264ft. After leaving spare kit at the Hohsaas hut, 2 minutes across from the lift station, we gear up for the Trift glacier and a session of what the French call 'Ecole de Glace' - refreshing or learning skills in the use of crampons & ice-axe, movement on snow & ice whilst roped, assessing for crevasse areas & coping with crossing crevasse zones, some simple crevasse rescue. All the while you will be gaining useful acclimatisation at about 3,400 m/11,500ft. Day 3 - Ascent of Weissmies, 4,017m/13,179ft. After a breakfast at 5am you will retrace your steps onto the Trift glacier to start the ascent of the NW Flank of the Weissmies, all on snow through some impressive glacier scenery. Because the hut is so close to the foot of the mountain the pace can be kept gentle, so plenty of time for stops to take photos, admire the stunning views, rest & drink plenty of water. From the Hohsaas hut to the Weissmies summit the ascent will be 887m/2,910 feet. Descent is by the same way. We return back to the Hohsaas hut & lift station & descend to the valley by mid-afternoon. In the evening we will have a meeting over a beer to discuss the next two days of acclimatisation & training. Day 4 - Walk to Tasch Hut, 2,701m/8,861ft, or Britannia Hut, 3,030m/9,941ft. Depending on the weather & conditions, choices for the next couple of days include the ascent of the Alphubel from the Tasch hut. If this option is taken you will meet the guide at 09.30 at the Hotel, then drive the 50 minutes, or so down the Saas Valley then up the Matter valley to Tasch. From Ottovan at 2,205m/7,234ft, a peaceful & beautiful side valley, a 2 hour walk takes you up to the Tasch hut at 2,701m/8,861ft, an ascent of 496m/1,627ft. Other options include the ascent of the Allalinhorn, 4,027m/13,212ft, from the Britannia hut, 3,030m/9,941ft. The hut is reached by taking a lift from Saas Fee to Plattjen, 2,570m/8,432ft, then a scenic walk up to the Britannia hut, with 460m/1,509ft of ascent. Day 5 - Ascent of Alphubel, 4,206m/13,799ft, or Allalinhorn, 4,027m/13,212ft. After a breakfast at 04.00 at the Tasch hut, you begin the ascent of the Alphubel, at first in the dark on a good path over boulder fields and glacier moraine, then up a 'dry' (i.e. ice) glacier to catch the dawn on the Alphubeljoch, 3,772m/12,375ft. From there it is a snow trek to the summit and its impressive wooden cross and spectacular views of Mont Blanc 50 miles to the West. Descent is by the same way back to the Tasch hut then to the valley & home to Saas Grund. The ascent from the hut to the summit is 1,505m/4,938ft. If the Allalinhorn option is taken, breakfast at the Britannia hut is a bit later at 5am, with the ascent taking the Hohlaub glacier then the Hohlaubgrat to the summit. Descent is by the WNW Ridge to the Mittelallalin lift station at 3,500m/11,483ft. With 997m/3,270ft of ascent and 527m/1,729ft of descent. The night is spent back in the Hotel Schoenblick. In the evening there will be a final check of gear before the trip in the morning to Chamonix and Mont Blanc. There will also be an opportunity to go over the route on the map and update on the latest weather & conditions on the mountain. This second ascent to 4,000m/13,100ft, with two nights spent in high mountain huts as well, gives great acclimatisation, and can make the difference between enjoying the ascent and suffering because of a lack of acclimatisation. At the same time the guides have been making sure that your technical skill level is at a good enough level to cope with what is demanded of you on Mont Blanc. Day 6 - Drive to Chamonix - 2 hours. Walk to the Tête Rousse Hut, 3,167m/10,390ft - 3 hours. You meet your guide at the Schoenblick Hotel at 09.00 am and then drive for 2 hours to Chamonix, stopping in the town for lunch, to pick up any last minute items such as headtorch batteries and water, and to make a last check of the Meteo weather forecast. You then drive further down the valley to Les Houches and kit up before taking a short lift to the Bellevue tram stop. From here you take the Tramway du Mont Blanc up to the Nid d'Aigle and start the gentle 3 hour walk up to the Tete Rousse hut. Anticipation builds as you pass tired mountaineers descending after summiting very early that morning. Day 7 - Climb to Mont Blanc summit, 4,810m/15,781ft. Descend to Gouter Hut. After a good rest and a few hours' sleep at the Tete Rousse hut you breakfast at the very early hour of 2.00am, trying your best to drink some tea or coffee and eat what is provided - usually dry bread and jam. Not easy, but very beneficial over the next few hours. With headtorch strapped to your helmet you rope-up and set out into the dark to cross the Grand Couloir, a famous spot but at its safest in the early hours when rocks above are frozen in place. The crossing is just a few metres but you'll feel relieved when it's done and you can then relax and start the easy scramble up to the site of the old Gouter hut at just over 3,800m. This is where you will stop and put on crampons for the start of the snow. Just a few metres beyond is the new Gouter hut where you can get inside and rest for a while, making sure to top up your energy reserves and don extra clothing if needed, or if it is windy, for the start of the long snow ascent to the summit. From the Tete Rousse hut to the new Gouter hut takes about 2½ hours. Feeling refreshed you set out again and face another two hours of seemingly endless zig-zag ascent to reach the Dome du Gouter at 4,303m. This is a very welcome waypoint as it allows you to take a quick rest and admire the twinkling lights of Chamonix way below; the Dome is an amazing place at this hour. The next section is actually downhill slightly to the Col du Gouter, welcome now but not so on the way back when it is an unwelcome uphill section for tired legs. After the Col you reach the Vallot refuge, an aluminium emergency shelter that offers a break from any cold wind that might be blowing at this wild spot. Again, you can top up on energy bars and hydrate before continuing the climb. The final 2 hour leg is a steeper ascent up the famous Bosses Ridge along to the Grande Bosse, 4,513m, then along a narrowing snow ridge to the Petit Bosse, 4,547m, before passing the rock of La Tournette, 4,677m, and continuing along the ridge. This is a stupendous vantage point with Italy away on one side and France on the other, but there is little time to admire the view as you push on to the summit. The final few meters are in some ways the hardest psychologically, and especially if you keep looking ahead as it is a convex slope so the top never seems to arrive! Emotions of relief and exhilaration sometimes run high as you finally stand on the summit. By this time dawn has broken and Mont Blanc casts its huge shadow miles to the west. What appeared as piercing rocky Aiguilles when viewed from the valley now look small from this highest point in western Europe. You spend some time taking photos before starting the long descent back along the same route, reaching the Gouter hut usually by midday. Here you spend the night enjoying a well-earned rest in the afternoon before the evening meal, retiring to your bunk usually by 9.00 pm, or earlier for most. Day 8 - Reserve day for Mont Blanc, or drive back to Saas Grund. Today offers you another chance at the summit if weather conditions were not conducive to an attempt yesterday and are clear today. If Mont Blanc was climbed yesterday, after a 7.00 am breakfast at the hut you descend to the Tramway again, passing eager mountaineers just off the tram and on the way up as you were only yesterday, although it seems like days ago! You arrive back in the valley at around midday, returning to the car for a change back into much missed trainers. There is an option for you to spend the last night at the Hotel Richmond in the centre of Chamonix, or drive back with the guides to Saas Grund. Whichever option is decided there will be time for a final celebration and a toast to the mountain Gods from a pavement café in Chamonix with a good view of the summit of Mont Blanc; a view made even more satisfying by the knowledge that you were stood on top only a short while ago. Day 9 - Transfer to Geneva. Fly to London. There will be a single timed minibus transfer from Saas Grund to Geneva airport - check with our office for further details. The trip was excellent, everyone was nice and we swapped stories of our life adventures. For the next week we climbed 3 mountains - it was BRILLIANT. I am so glad I did this and will be doing it again. Thanks to Kevin O'Neale and Mountain Kingdoms. Office staff organised when we liaised with them. Kevin O'Neale was an excellent guide and the package was amazing in terms of the mountains we summited and mountain huts we stayed in. Kevin's agenda and efficiency for the week was superb and although we not did summit Mont Blanc due to the weather we did achieve three 4,000m+ summits. A truly memorable and awesome week - our thanks to Kev and to Mountain Kingdoms for employing his services. The pre-Mont Blanc climbs were more demanding and more useful than on a previous (unsuccessful) trip with another company. Liked the provision of technical kit e.g. crampons.